Make Communicating and Listening to Your Baby Easier with the VTech Audio Monitor! And it was time for a new baby monitor!! I dreamed of being able to move from room to room without having to plug in the monitor and I also dreamed of having more than one parent unit so that I could leave one unit downstairs and one upstairs. My dreams recently came true when I generously received the Safe & Sound Digital Audio Monitor with two Parent Units from VTech. It has so many amazing features that I can't wait to share with you and I am truly in baby monitor heaven! My favorite features I must say is that it includes two parent units! I have never had that before with a monitor and I LOVE that I can leave one upstairs and one downstairs and have one nearby at all times to hear if my daughter is crying! Another super unique feature that my family is really enjoying is the Talk-Back Intercom System. This features allows me to communicate with my daughter from the parent unit to the baby unit. This creates almost like a walkie talkie type of monitor because two way communication is possible! This is great when I need to tell my husband something while he is upstairs with the baby or vice versa and my son just loves to tell me he loves me while I am upstairs with the baby! (except he always forget to push the button so he gets sad when I don't say I love him back since I didn't hear him! :) It is also great to for soothing your baby from another room or even from outdoors. Here is our parent unit upstairs! And here is the 2nd parent unit downstairs! I also love the Vibrating Sound Alert which enables some added peace by allowing me to be silently alerted when there is sound in the baby's room and also the Night Light on the loop of the baby unit illuminates to be used as a night light. This is the baby unit in the nursery! Five Level Sound Indicator - Turn the sound down on the Parent Unit and rely on the visual sound alert LEDs to indicate sound levels in the baby's room. Belt Clip - Take advantage of the extended range and rechargeable batteries on the parent unit by using the built in belt clip. Backlit display on parent unit. Rechargeable Batteries - With up to 18 hours of monitoring time, have the freedom to carry the parent unit everywhere you go without the hassle of a power cord. Secure Transmission - The signal is digitized and encrypted ensuring that all transmissions between the baby unit and parent unit are private and secure. Extended Range - Up to 1,000 feet of range allows you to feel safe and connected to your child while you go about your day. ear are coming from your baby. I definitely recommend the Safe & Sound Digital Audio Monitor with two Parent Units for large houses so you don't have to carry the parent unit up and down stairs and also for parents that need to communicate more easily! I love the Intercom capabilities! 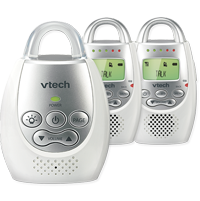 Buy It: You can purchase the Safe & Sound Digital Audio Monitor with Two Parent Units for $59.95 on the VTech website.